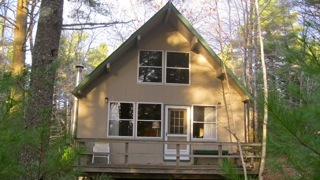 We're thrilled to own a beautiful cabin on two acres of wooded land on Mt. Desert Island. It's available for weekly rental. Located in Hall Quarry. It's only 15 to 20 minutes from ImprovAcadia, and just up the hill from Echo Lake.